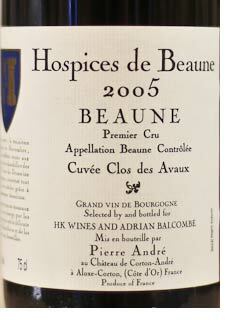 The Hospices de Beaune is a fifteenth century institution, originally founded just after the Hundred Years War. Over the centuries it was given vineyard land as well as other assets and the proceeds of the annual wine auction still benefit Beaune's hospital, though it is now situated away from the famous timbered edifice. Wines from the donated vineyards are made and aged by some of the region's leading producers and merchants. It's very rare to be able to offer such a delicious and mature Hospices de Beaune wine - we wish there were more such opportunities. We've had the chance to taste this Clos des Avaux twice now, including a prolonged examination at home over a couple of nights, a rigorous test it passed with flying colours. The great 2005 vintage needs no introduction and with thirteen years of slow ageing in professional storage this wine is complex and layered with structure, lovely texture and mature flavours. But it has plenty of ageing potential remaining.